BL and I LOVE this meal, our spin on a hearty chili. Packed with fiber, protein, folate, and iron this meal is not only delicious but good for you. He made this for me when we first starting dating and it’s become a permanent meal in our house. I love brown rice here but feel free to use any whole grain you have on hand. 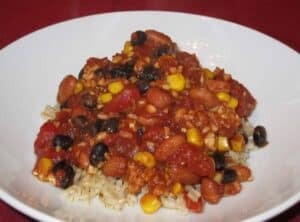 I cannot stress enough how super easy this meal is, open a few cans of beans, add brown rice and tempeh and you have a quick weeknight meal. Not the prettiest meal but man, is it good. The filling is also great on its on, in burritos, or tossed with lettuce for “taco” salad. Prepare tempeh by steaming for about 10 minutes. This step is optional but I like steaming tempeh first before crumbling it. Remove the tempeh from the steamer basket and let cool. Crumble or finely dice, set aside. Heat a large skillet pan and add the tempeh, corn, beans, tomatoes, seasonings, and jalapeno peppers. Continue to cook over medium-high heat until warmed through, about 10 minutes. Serve over brown rice. So yummy! What are your favorite 30-minute or less dinners?